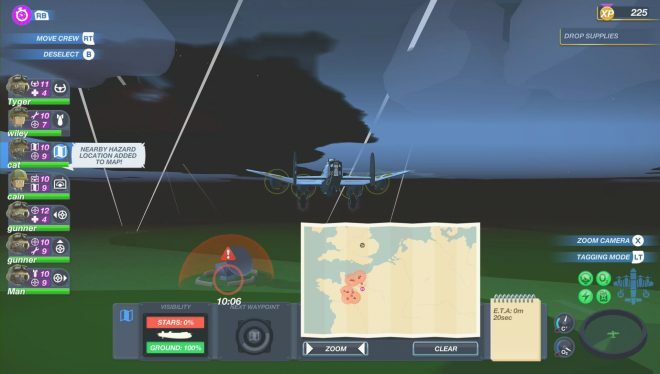 Bomber Crew is set in WW2, and your mission is to blow things up while fighting enemy aircraft. Sounds like a good time right? It’s a strategy and simulation game and players will hire crew members and choose parts for their bombers. They are then faced with multiple types of objectives. There is bombing, dropping off supplies and even objectives to take pictures. 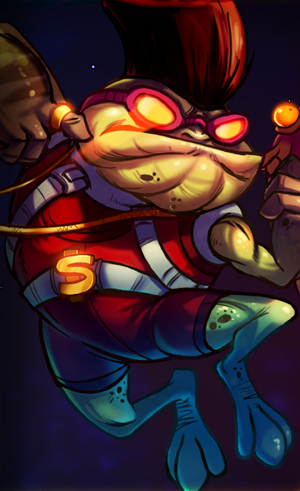 As you gain experience, you unlock new upgrades and perks for your crew. Time management is the heart of the title. You must react in real time to situations that arise. Be warned; if you have high anxiety this might be stressful! Gameplay–There’s a great mix of time management and strategy. If you enjoy games like Sally’s Salon or Overcooked, you’ll realize fast that this is almost an adventure version of them. There will be times you feel overwhelmed with all the tasks you need to have your crew perform. Maybe an engine is on fire, but also a crew member is downed and needs to be revived. What if that crew member is your repair guy? You must then take someone off one of your turrets while planes are still attacking, but now you’re more vulnerable, and your turret guy heals slowly because he’s not trained enough. The game adds thrills and panic to what appears to be a casual enemy encounter. While not every mission will create these burdens, they’re both unwanted but welcomed. As you complete missions you will advance to different stages of the game that add more difficult elements. Suddenly you have to worry about enemy radar towers that alert enemies of your presence, so you must create custom paths around them. You have to avoid flak cannons that paint what feels like the entire map. Ace pilots will enter the mission and can be pretty difficult at times to take down. There is a good balance that counters what could be frustrating, into something fun. Customization– Fans of personalizing and customizing things in a game can rejoice in the fact that there is a good amount of it. 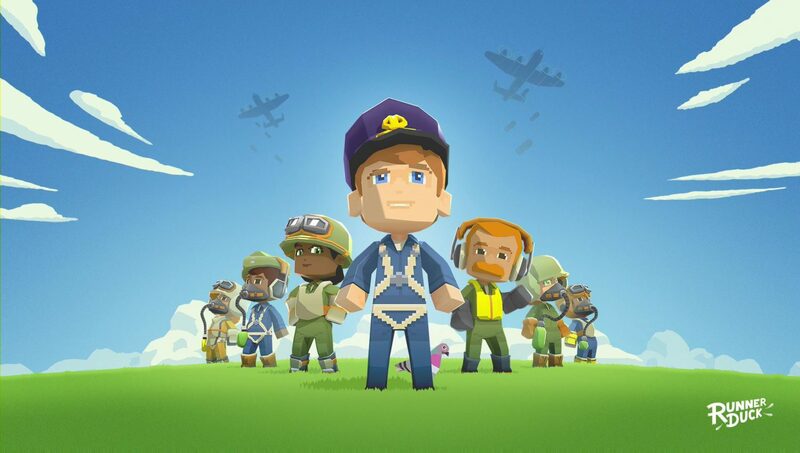 You can dress up your crew, give them different gear with different stats and even change the colors and patterns on your bomber. 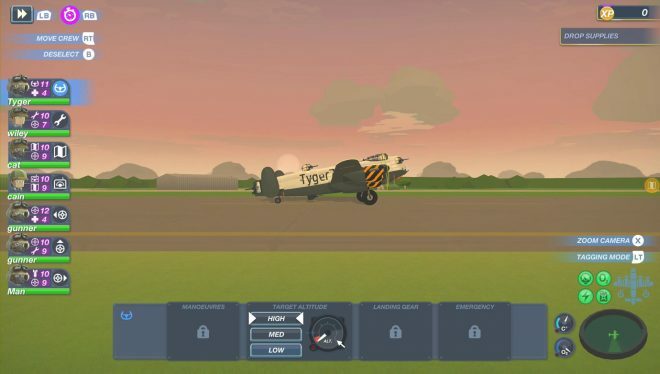 Your gamer picture can even be added to your plane! If you don’t like any of the built-in stamps/stickers, you can actually draw your own. While you won’t be tempted to spend hours doing it, you will enjoy the quick changes you can make between missions. On the side of the plane, you can write what you want to. Naming your crew members can help you remember who is who a lot easier. This element gives the satisfaction of making the adventure your own. Taking Off and Landing– While departing from the runway and landing on it are both simple tasks, they seem to have been quickly thrown together and forgotten about. Sometimes as soon as you take off from the runway, something will go wrong with the plane. While this isn’t game breaking, it is kind of annoying. You cannot pick where your crew starts, even when they get a secondary profession. Your repairman can also be a turret gunner; however, he might start off in a chair doing nothing. You will have to continually adjust him to take a turret or become the guy dropping bombs because the bomber is placed in a turret at the start. You should really be able to pick who starts where. The task of assigning the starting rolls gets old quick. It will almost always begin with moving the bomber to the position he should be in, then the repairman to the front turret. This really makes no sense and forces you to reposition every mission. Then there is landing. You highlight the runway while you’re approaching it. Your pilot then seems to get confused and forgets how to fly. You often go in the wrong direction and make odd turns, which makes the experience feel very glitchy. Luckily there is a speed up button so you can save time while you watch your plane zig-zag around like a rookie pilot is controlling it. Progression– There is a definite lacking middle portion of the game. While you get used to the mechanics and customization, you seem to crash into a wall (figure of speech). You don’t want to progress too far in fear of encountering missions too difficult. The missions are endless but are tiered. When a critical mission is shown, you may complete it and move on to somewhat harder challenges. You’ve been grinding missions and working hard trying to get the best parts for your plane, but don’t want to commit to the possibility of being shot out of the sky and losing all your crew members. When you lose your crew, you have to hire fresh new ones. This means all of their perks are gone, and you have to level them all over again. The bomber will also have to be upgraded again which can cost a lot of money. This can be difficult if you’re farther in the game. The only solution is to never die. You can force quit the game before the mission ends in order to retry. When you buy parts for your plane, you lose the previous part and gain a percent of the cost back. You can’t just own all the parts, which makes switching things around to test them out in combat almost impossible unless you’re willing to add hours more to your time with playing. 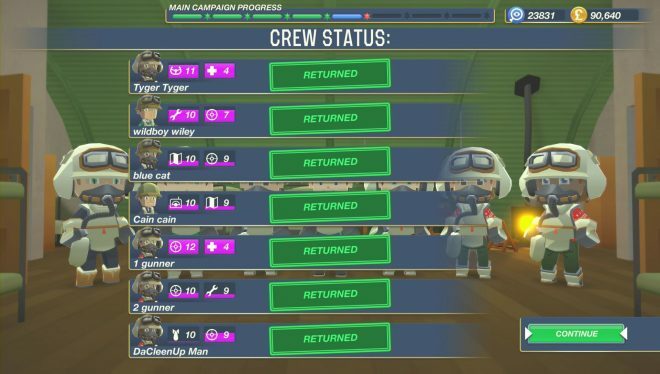 The best way to tackle the campaign is to play missions to gain experience and money, then once you feel fully upgraded, move to the next stages. If you’re about to die, force quit and try again. Playing this way can get boring pretty fast, but seems the best way to be successful. A better option would be to revive the crew members who died by having to spend currency on them. Progression seems more designed for players who love the idea of losing everything when they die and basically starting over. Voice Acting– There is none. When people talk, it sounds like mwa-mwa-mwa. You must read what they say. It would have been a lot more helpful to hear the conversations and warnings with real voice acting. They wouldn’t even need anything fancy, as there aren’t too many lines in the game. While worrying about the action going on, it’s hard to pay attention and read everything. It really doesn’t add much difficulty, but having a headset on and getting cues from your crew about what’s going on would have been a really nice touch to the already great sound of the deafening engine. Map– The map is the same in every mission. You take off, fly over some water, and there’s a big stretch of land. This can become a bit boring. An addition of weather changes would have put a spin on it. Rain and snow could have added more strategy and a fresh look. You feel like you’re just playing the same mission but with different objectives (that’s because you are). 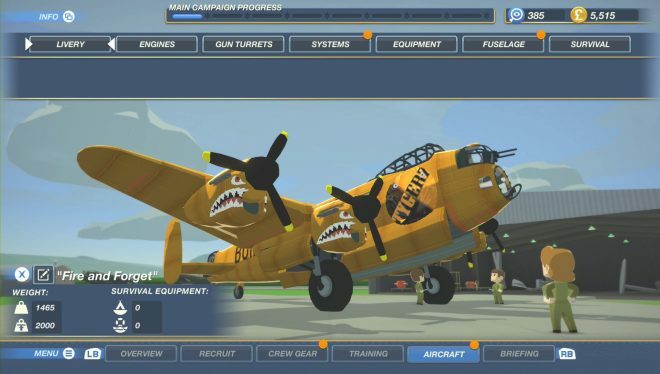 Love it or hate it, what was done with Bomber Crew was done mostly right. While there are a few disappointing aspects, the overall experience can be a great one. There is plenty to do and hours to spend if you enjoy the core concepts. 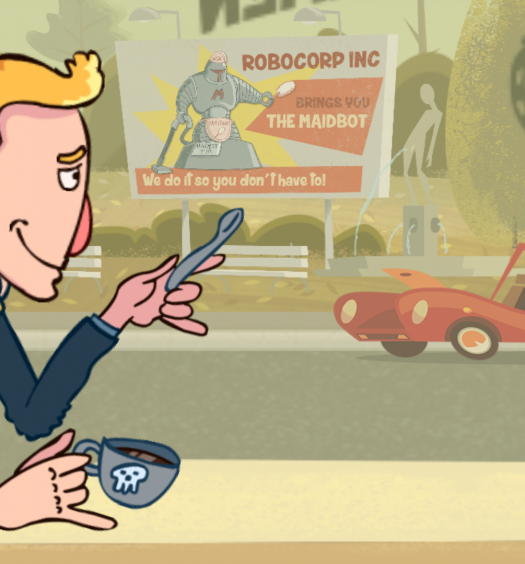 The graphics aren’t going to win any awards, but do manage to have their own sense of charm. If you’re into World War era games and bombers, you may even have a deeper appreciation. 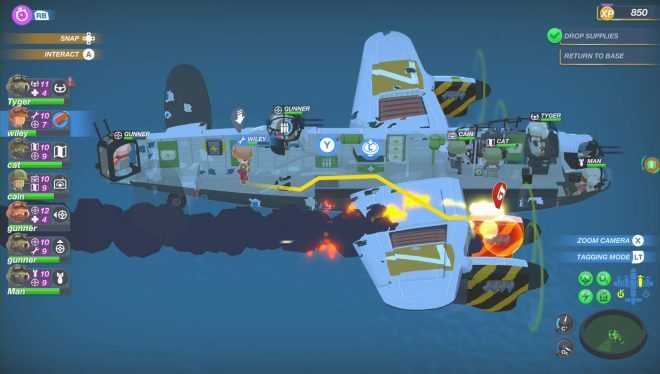 Bomber Crew was developed by Runner Duck Games and published by Curve Digital on Xbox One. It was released July 10, 2018, for $24.99. A copy was obtained free through Xbox Game Pass.